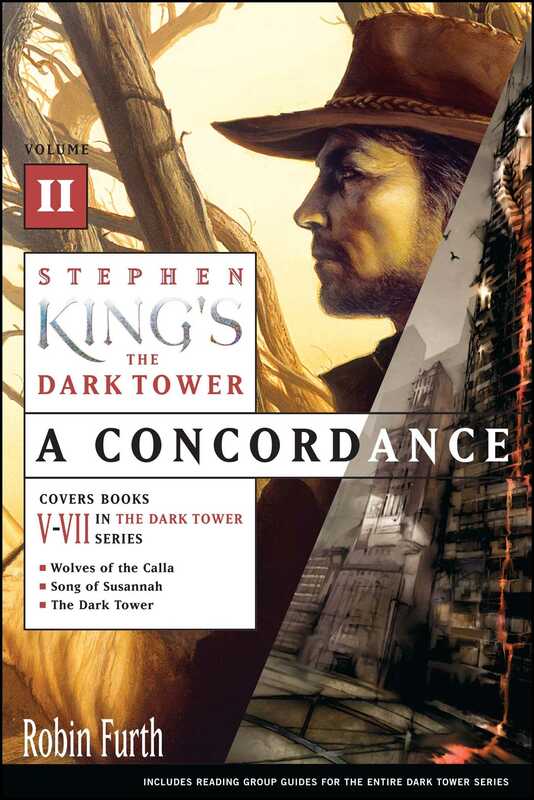 A Concordance, Volume II is the definitive guide to the many worlds, argots, characters, and cross-references— within Stephen King’s bestselling epic Dark Tower series and among the rest of King's work—that appear in Books V through VII: Wolves of the Calla, Song of Susannah, and The Dark Tower. you have finished all seven of the Dark Tower books. For those of us who have traveled with Roland Deschain from the wastes of the Mohaine Desert to the Castle of the Crimson King and then beyond, to the farthest reaches of End-World, the journey has been a long one, say thankya. For many Constant Readers, it has taken over twenty years; for sai King, the travels have spanned more than thirty. And for Roland, who is able to leap over whole generations in pursuit of his quarry and his quest, the pilgrimage has lasted more than three hundred. Yet as Eddie Dean points out at the beginning of Wolves of the Calla, time is elastic. Despite what we've been told about the accuracy of clocks, no two sixty-second periods are ever identical. Although a minute may move like dried mud while we're waiting or when we're bored, it speeds to the point of invisibility when we're in the throes of change. And what is a novel but a tale of transformation and discovery? Over the course of the Dark Tower series, we witness tremendous transformation, both in our characters' natures and in the parameters of their quest. What began, in The Gunslinger, as the story of one man's obsessive pursuit of a goal becomes, in the final three books of our story, a tale of personal, and universal, redemption. By the time we reach the final page of our saga, we have witnessed so much. Roland, once a lone traveler willing to sacrifice anything and anyone to the achievement of his end, has drawn three companions to him and has trained them to be gunslingers. With his new tet-mates, Roland discovers the Bear-Turtle Beam and follows it to the haunted regions of End-World, where the Dark Tower sits. Along the Path of the Beam, the bonds of khef, which unite his new ka-tet, are tested and prove to be strong. And Roland, always an emotionally reticent man, rediscovers his ability to trust and to love. With this newfound knowledge, he can finally admit, and repent of, all of his previous betrayals. In many ways, the Dark Tower series falls into two parts: the adventures that Roland and his companions have in Mid-World (all of which were written before Stephen King's accident in 1999) and those that take place in the borderlands and End-World, which were penned after King began to recover from the accident that almost claimed his life. The adventures our tet have in both halves of their tale are dramatic, but the nature of the changes they undergo as a result are quite different. In the first four Tower books, the transformations our tet experiences are, in large part, personal. As well as bonding as a group, united in their vision of one day reaching the Dark Tower, each member has to battle his or her own demons. Eddie overcomes heroin addiction. Susannah's dual personalities of Detta and Odetta merge into a unified whole. Jake abandons his lonely life in New York to join his adopted father's quest, and Roland, who up until this point has been a self-obsessed loner, learns to value his tet as highly as he values his search for the linchpin of existence. Yet if the first four Dark Tower books are about the khef5 that binds self to ka-tet, in the final three novels, the responsibilities of khef ripple outward, encompassing not just the debt the individual owes to his tet-mates but the responsibilities each of us has to the greater world -- or, in the case of the Dark Tower series, to the multiple worlds. In the final three books of the Dark Tower series, Roland and his friends extend the scope of their quest. While keeping their ultimate goal in mind, they set out to accomplish a number of specific tasks that, when taken together, simultaneously halt the erosion of the Beams, frustrate the apocalyptic plans of the Crimson King, and work for the common good. In Wolves of the Calla, they destroy the robotic, green-cloaked horsemen who have been stealing children from Mid-World's borderlands for more than six generations. By doing so, they not only liberate the people of the Callas but undermine the efficiency of the Breakers -- those prisoners of the Crimson King who have been forced to erode the Beams with the equivalent of psychic battery acid. In Song of Susannah, Jake and Callahan manage to put Black Thirteen, the most evil of Maerlyn's magic balls, out of commission. With the help of John Cullum (their Stoneham, Maine, dan-tete), Roland and Eddie begin to lay plans for the Tet Corporation, a company created to undermine the powers of the evil Sombra Corporation and to protect both the wild Rose, found in New York City's Vacant Lot, and our kas-ka Gan, Stephen King, creator of our tale. By accomplishing these tasks, our tet remains true to the Way of Eld, which demands that gunslingers protect the weak and vulnerable from those who would oppress or exploit them. Yet in defending the White against the ever-encroaching tide of the Outer Dark, our tet (like our author) comes under the shadow of ka-shume, the shadow of death. In The Dark Tower, Roland and his friends destroy the Devar-Toi, or Breaker prison, and free the Breakers.9 They halt the erosion of the Beams (which we are assured will regenerate), but Eddie Dean pays for this victory with his life. Not long after, when Roland and Jake travel to the year 1999 so that they can save their maker, Stephen King, from his predetermined collision with a Dodge minivan, Jake Chambers heaves his last breath. It seems that ka demands a life for a life, and though Stephen King survives his terrible accident, Jake does not. And it is here, on Slab City Hill in Lovell, Maine, by the prostrate and profoundly injured body of our kas-ka Gan, and by the side of our gunslinger Roland, who grieves over the corpse of his adopted son, that I would like to pause. It is not a comfortable place to be -- either for sai King, who lies bleeding in a ditch, or for us, who are unable to help -- but it is an important place. Like Detta Walker's Drawers, this little patch of road in the year 1999 (when the ka of our world and the ka of Roland's world are united) is a place of power. It is a doorway between the rational and irrational worlds, a place where the veil is at its thinnest. And it is in this place where life and death meet that Roland accomplishes something worth discussing. By sacrificing what he loves above all else in order to save the life of the man who created his universe -- a man who must live if the story of the Dark Tower is to exist in any world -- Roland does what we assume is impossible. He stops the wheel of ka and alters its path. Throughout the final three books of the Dark Tower series, we are told that, in the Keystone World we inhabit, there are no do-overs. Once an event has taken place, it cannot be changed. Yet it seems that this "truth" is not necessarily true. At the end of Song of Susannah, we are given Stephen King's obituary -- ostensibly taken from the Portland Sunday Telegram -- which states that King died at 6:02 PM on Saturday, June 20, at Northern Cumberland Memorial Hospital in Bridgton, Maine. Yet King didn't die. As we all know, he survived (albeit with terrible injuries) and returned to his computer keyboard to finish the last three books of his Dark Tower saga. On one level of the Tower, King's life was saved by paramedics and doctors, and that most fickle of mistresses, Lady Luck. But on another level, the one that we all inhabit when our rational minds switch off and our imaginations wake up, Stephen King was saved by his characters. When I was nineteen, I read a play by the Italian playwright Luigi Pirandello. The play was called Six Characters in Search of an Author. In it, six characters -- all of whom have been abandoned by their original creator -- go in search of a new person to pen their story. The person they turn to is a theater manager, already in the process of staging a different play. At first, the theater manager thinks these characters are either mad or joking, but as their traumatic story begins to unfold, he finds himself drawn into it. But no matter how the new playwright (for that is what he becomes) tries to bend the plot or alter the characters' temperaments, he can't. You see, the story already exists, from beginning to end, and the characters who live within its unwritten pages stubbornly hold on to their unique identities. What they want, and what they demand, is a writer who is willing to stand and be true -- a person able to facilitate their tale and give it life, tragic as that tale turns out to be. A number of years ago, in a writers' magazine, I read a firsthand account of an author's experience creating a character, and that, too, has remained with me. The author of the article (who was writing for an audience of apprentice authors) told of her experience with a character she called Bird. And though I lost the article long ago (which, like so many things in my life, I put in a place that at the time I had deemed "safe"), I still remember Bird. You see, Bird saved his author's life. The story began when the author in question received a grant to finish her novel. She and her husband went to a remote cottage where the isolation and quiet would be perfect for the task at hand. However, it was winter, the cottage was old and cold, and the journey had been long. The woman and her husband shut the door and windows, turned on the stove, and decided to take a nap. What felt like hours later, the writer was roused by Bird shaking her. Groggily, she opened her eyes and there was her character, standing by the bed. Bird put his hands by his throat. "I can't breathe!" he said. And then suddenly, the author realized what had happened. The old cottage was much less drafty than it had originally seemed, and the fire had eaten almost all of the oxygen. She and her husband, unconscious beside her, were asphyxiating. Almost unable to move, the writer rolled onto the floor, crawled to the door, and managed to push it open. Fresh winter air wafted into the room, and both she and her husband survived. But only because of Bird. The explanation this author gave for her paranormal experience was this -- she hadn't finished telling Bird's story yet, and Bird couldn't survive without the umbilical cord of thought which connected them. In order to live, Bird needed her to live, and Bird was determined to exist in the world. Self-serving heroism? Perhaps. But does that lessen the act's importance? Definitely not. Especially as far as the author is concerned. I once read an article about the early-twentieth-century French explorer, Alexandra David-Neel. Evidently, while she studied with monks in Tibet, she learned how to create thought-forms by focused concentration. These thought-forms, which spring from the imagination of the creator, eventually gain an independent existence and can even (if they are especially powerful) become visible to other people. For me, characters are a kind of thought-form. An author creates them (or facilitates their passage into our world), but then the characters exist in the minds of many. They can live well beyond the lifespan of their creators; they can even exist independently of the book or story they originally inhabited. Think of Hamlet or Heathcliff or Dracula. Or of Roland Deschain. There are some Dark Tower fans out there (including some very close to my heart), who like it when Stephen King appears in his films, but who are not comfortable with him entering his fiction. The reason? When King enters his own stories and his characters are shown to be just characters, it breaks the spell. When you think about it, such a reaction -- even among devoted Tower junkies -- isn't so surprising. Given the world we are expected to live in, where fact is supposed to be fact and fiction is supposed to be fiction, the two of them as separate as our waking lives and our dreaming lives, the events that take place in the final two books of the Dark Tower cycle are bound to confound us. The traditional suspension of disbelief, which we put on like a thinking cap whenever we sit down to read a fantasy adventure of any kind, isn't enough anymore. We have to allow the magic of that world -- the world of the book -- into our world, where we must earn a living, pay rent, eat, argue, and worry. In other words, those barriers we erect for our self-protection -- barriers which separate our imaginative lives from our mundane ones -- begin to break down. And if we're not careful, the guardrails of the rationalist, no-nonsense universe begin to snake out of control. And if those rails disappear, then we can free-fall into todash space, that no-place between worlds where monsters lurk. As normal, functioning adults, we can't believe in surreal experiences any more than we can maintain that clapping our hands will bring Tinkerbell back to life. After all, we left all that behind us in grade school. Or did we? For me, the scenes where Stephen King's characters enter his life, and change it, are very powerful. They are powerful because they express the secret relationship King has with his creations. As every writer knows, writing is a two-way street. We may give birth to our characters, but our characters also change us. When Steve King writes about Eddie and Roland visiting him in Bridgton and then, many years later, Roland and Jake coming to him in his hour of deepest need, he is spinning a yarn, but he is also sharing with us the secret story that, in some deep part of his mind, he is telling himself. For the members of Roland's ka-tet, saving Stephen King is essential. But for Stephen King, his characters call him back from the void. Their need explains his survival. Some people have guardian angels. Authors have characters. This may be a strange thing to say, but all of you out there who write know it's true. I suppose I have always believed that reality is a subjective affair. Of course, there are always events outside ourselves that are concrete and real, and that -- small as we are -- we cannot change. Yet in the back of our heads, there is a voice that takes our experience in the world and weaves a story from it, for good or dis. And I suppose that it is this doorway, the doorway of the imagination, that is the ultimate Door to Anywhere. It gives us hope when there seems to be no hope, and it allows us to enter worlds that our rationalist culture tells us are unreal. I don't know about you, but I'm certainly glad the rationalists are wrong. And so, my fellow Constant Readers, on this note, I will leave you. During my 1,396 days living and working in Mid-World,10 I, too, have changed. But that's the nature of both life and fiction, isn't it? Ka turns, and the world moves on. If we're lucky, we move on with it.